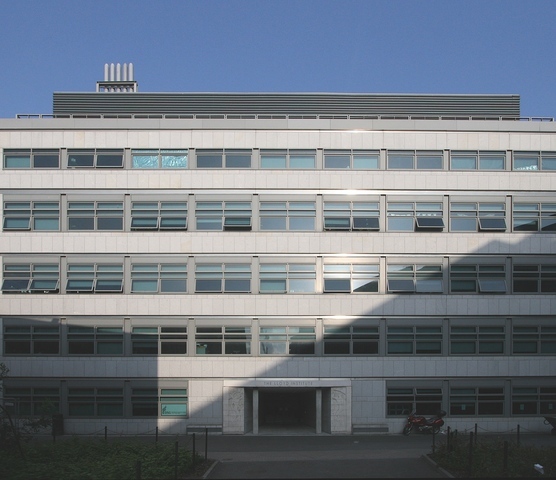 All of the scientific talk sessions will take place in the MacNeill lecture theatre, located on the first floor of the Hamilton Conference Centre on the main TCD campus. This lecture theatre is equipped with a full range of modern presentation tools. For details on the capabilities available, please see the Presentation Guidelines. Posters will be displayed on the lower concourse (ground floor) of the same building, where refreshments will be served during the coffee breaks. The location of the Hamilton Conference Centre within TCD is indicated by the green icon in the map below. The Hamilton building is recognizable thanks to its outdoor flight of stairs which takes visitors straight to the first floor. Specific directions from each of the main TCD gate entrances are given below. Upon entering front square, walk straight on towards the Rubrics (wide redbrick building) and pass by its right-hand side. This will take you past the Berkeley Library, with the noteworthy "Sphere within Sphere" sculpture by Arnaldo Pomodoro on the right. Keep moving past this sculpture, turn right through the Rose Garden then left so that you're walking between the rugby and cricket pitches. At the far end of the pitches you will see the new Walton Sculpture. Walk past the sculpture and you come to the outdoor stairs of the Hamilton Building. Turn right and follow the outer wall of the Hamilton Building, recognizable by its row of square columns, until you reach the main entrance on your left (marked as the Panoz Institute). This enters on the ground floor, with the registration desk located to your right and the coffee & poster sessions held at either end of the concourse. Alternatively, the external stairs lead to the first floor where the conference talks will be held in the MacNeill theatre on your right. The Pearse Street entrance is the closest gate to the nearby Pearse train station. After passing through the Science Gallery covered walkway, keep moving under the railway bridge and veer left so that you keep the Lloyd Building on your right. You will then see the outdoor stairs of the Hamilton Building forward and to your left. Continue along the outer wall of the Hamilton Building, recognizable by its row of square columns, until you reach the main entrance on your left (marked as the Panoz Institute). This enters on the ground floor, with the registration desk located to your right and the coffee & poster sessions held at either end of the concourse. Alternatively, the external stairs lead to the first floor where the conference talks will be held in the MacNeill theatre on your right. Upon entering through the Lincoln Place entrance, follow the outer wall of the Hamilton building on your right, recognizable by its row of square columns, until you reach the main entrance on your right (marked as the Panoz Institute). This enters on the ground floor, with the registration desk located slightly to your right and the coffee & poster sessions held at either end of the concourse.